I'm mostly logging in for operations at the moment, and that's okay. What's not okay, or at least not great, is that ops have been nothing but a struggle for weeks and it's really starting to get people down. I blame the difficulty. Now, before you tell me that I need to learn to play, let me explain a bit. For most of the time that I've been with my guild, I've thought of it as a hardmode guild. Just based on experience, hardmode operations are where we spend most of our time making smooth progress while still being challenged. Story modes are easy for us. Nightmare mode is the kind of content we'll stick our noses in once we've cleared hardmode, and while we'll manage to kill a couple of bosses, it takes us very long and I don't think we've ever finished a NiM operation before the next raid tier was released and allowed us to overgear the content. I think it's okay to acknowledge these limitations. The vast majority of the player base has them. Unless you're in a small number of top guilds, you're always going to run up against a progression wall eventually where the difficulty of the content is increasingly too high to overcome for the combined skill level of you and your guildies. It's a normal part of engaging in this kind of endgame. It is however also a risk, because if people run into a wall for too long, they get frustrated and stop logging in. From Bioware's point of view, the trick is therefore to combine the inclusion of challenging content with giving people the ability to progress for as long as possible without hitting a wall. Tiered difficulty levels are a great way of achieving this, because it adds several different steps for people to climb and therefore stretches things out. Ideally, you then release a whole new operation before people have had time to get frustrated with whatever difficulty mode they can't beat. Ravagers and Temple of Sacrifice have been very unforgiving in that regard. I've said from the start that I feel that their story modes are too harsh in parts and are likely to turn casual raiders off the whole thing before they even have a chance to get started. 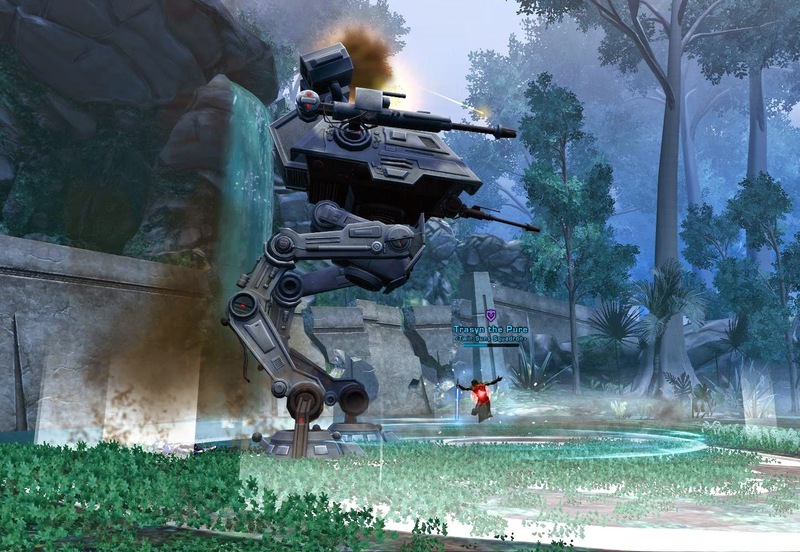 HealingSWTOR also asked back in February whether the operations are too hard and included the hardmodes in his question. Many experienced raiders have noted that the hardmodes for Ravagers and Temple of Sacrifice are more on par with the difficulty of nightmare mode in previous tiers. So when you have a (slightly too diffcult for what it's supposed to be) story mode, immediately followed by what's effectively a nightmare mode, where does that leave a hardmode guild? Not in a happy place. For comparison, I've looked at what I posted about Dread Fortress and Palace back when they were current content - we had to put up with them for over a year after all. From what I can tell, it took my ops group a little less than six months to clear both operations on hardmode. That means that on average, we killed a new boss every two to three weeks. To me, that's pretty good in the sense that it's neither so fast that things feel too easy, nor so slow that frustration starts to build up. But then we moved on to nightmare, and things started to slow down. Nefra was comparatively easy, but Draxus took us something like two months to get down, and even as we managed to tick off a couple more boss kills, we couldn't always get them down consistently, which made it all the harder to actually get any time on later bosses that we were supposed to progress on. In hindsight I'm pretty amazed that we managed to keep ourselves busy with nightmare modes for more than half a year under those circumstances, without going completely bonkers or having people rage-quit en masse. That level of difficulty just isn't our forte and we simply spent way too much time wiping and not achieving anything for it to be a lot of fun. And now? Well, we cleared the story modes in the first week and got HM Sparky and Malaphar down quickly. That was back in December. For the last four months however we've been struggling with what comes after. We have got both Bulo and Sword Squadron down, however it's still incredibly hard to repeat those kills, to the point where we haven't really had a chance to really work on the third boss in either operation. You can do it! Or can you? This shouldn't be the state of things less than five months after the launch of two new operations. It really makes me miss hardmodes that are more tuned to our skill level. I don't begrudge the NiM raiders their fun, but at the moment I can't help but feel a little left out in terms of endgame content that suits my abilities. I really, really can't wait for the next operation, and I very much hope that Bioware will reconsider their tuning for that one. We're in the same boat. We're stuck on Bulo at the moment and have been for a few weeks. Our best is around 20%. I think there's just a little too much randomness, which is causing havoc with guilds at our skill level. I think the fight would be much better if Bulo followed a predictable path in where he jumped. The RNG is indeed deadly, especially since positioning is so important in all these fights. We've had the same problem with Bulo, in the sense that we're mostly OK when he stands in certain places but if he jumps to somewhere unexpected, people are often suddenly out of range of healing or something like that and it tends to snowball from there. Totally agree with your post. My guild is stuck on HM Bulo (most work on him) and Sword Squad. Made great progress initially and then we just stopped. A combination of skill checks, randomness, and lack of interest have led to little to no progression runs. With summer approaching, RL has also come into play. Not only that, but other people have decided to play other games as well. What do you think will be the next ops update? I heard rumors of 3.2 having some nerfs to HM, but I will believe it when I see it next week. More realistically, I think we may get Rav/ToS NiM with 3.3. New ops will probably happen in Fall or Winter. Interestingly, there was a 400 day gap between the introduction of Dread Fortress/Palace and Ravagers/ToS. I don't think Bioware will ever do that again... probably something like 180 to 270 days for new ops. I made a timeline of the various updates if you are curious! I originally heard a rumour that 3.2 would have a new operation, but that does seem unlikely at this point considering everything else they are adding with that patch. I'm hoping that it's at least true that they are working on one; maybe it might come out in 3.3 then (here's hoping). To be honest I think/hope that they may simply skip NiM for Ravagers and ToS, simply because of the way they tuned hardmode. With HM being this difficult already, nobody but a handful of world-first guilds would even get into NiM. We may get a boss op, like TC, with the secrecy behind the end of Ziost. There's also that Sith creature shown on Ziost that could be it. I totally agree with the assessment that the current hardmode raids are on par with earlier nightmare modes. 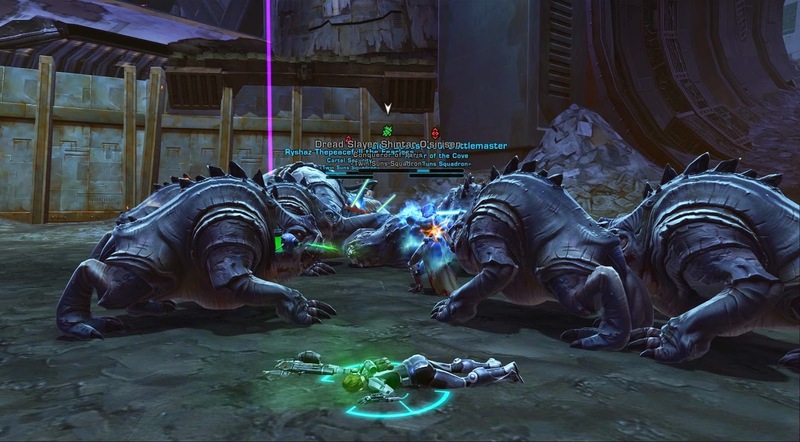 We've been working for over a month now on Master & Blaster HM and although we really should be able to down it one of these days it may get tough to keep our spirits up. From everything I've heard Coratanni is going to be worse (and let's not even start about Revan...). My Republic guild is still working on the Walkers HM and that isn't going very fast either. I'm sure we'll be able to do it eventually, but with the Dread operations we did manage to clear most of Hm within a much smaller time frame. It's quite scary to me to think that there are bosses this tier which are giving even guilds like yours trouble (after you cleared Bulo and SS relatively quickly). That is not encouraging for those of us who already struggle on those earlier bosses, lol. Oh hell, who am I kidding? I don't have the skill to see the inside of a Story Ops, much less a Hardmode one. Here's a question that I'd pose, however: do you think that Bioware could nerf Story and HM enough to restore that balance, or would it simply annoy another separate group of raiders? You know somebody had to say it! I'm not sure how well nerfs would be received at this point (which is why I didn't ask for them in my post). A few nerfs to selected story mode bosses would probably be universally welcomed, simply because everyone agrees that it's story mode and shouldn't be that tough. Hardmode though... I think the guilds who enjoy progressing through the current difficulty would be understandably pissed off, and while they are a minority, they are a very vocal one. I haven't been in the game long enough to see these OPS. I will say with previous games, AOC comes to mind first that raids can and will break guilds. I think occasionally a slight nerf is in hand to balance things out. That being said though, it takes an incredible amount of energy for a Raid/OPS Leader to maintain motivation. One of the hardest things is to keep a team together and focused without getting frustrated. I've sat on the sidelines through various guilds competing in the content arena. Many get too edgy and cut throat and it leads to general discontent within a crew. Keeping calm is the biggest thing. Yes, every victory is something to be extremely proud of because of the amount of timing and coordination it takes to beat an encounter. Still the Leader needs to balance competitive gain versus the morale and esprit de corps of the team. Never loose heart regardless of the odds. But knowing when to review strategies and work on deficiencies in honest and respectful discussions is just as important. The hardest part is trying to get a coherent After Action Review to work the loose ends and fix the strategies. There is no blame game in this, just identifying afterword what needs to change and what needs to sustain. BOTH are equally important. Of course after a night of banging your head against the wall can certainly make people want to walk away and not work on the encounter. This takes the Leader sitting down and reviewing everything, then putting it to a pre mission brief at a later date. It's hard work and very taxing. Ultimately it's the Leader's responsibility to hold the crew together. This is especially true for progression driven teams. In the end, sometimes it is better to nerf an older instance down a little making way for the tougher new content. But it still falls on a group Leader to keep the team together, focused, motivated, and above all..HAVING FUN. Once you loose the fun factor, it becomes a chore or a job. Then it is no longer a game. Don't worry, I could tell it was you! And you used to read my old WoW blog, Priest With A Cause! It's also always nice to meet another person who prefers to go down the road of multiple blogs for multiple games - we seem to be quite a rarity compared to the people who like to have a single general gaming blog. Way to go on the take down Shintar! And yes it's nice crossing paths with people from previous games. I do agree with you, separate blogs for separate games. When one has run it's course, give a goodbye and thanks for the fun times, then start a new one where you decide your current focus is.